The Old Town Bridge Tower (Staroměstská mostecká věž) is an impressive Gothic structure guarding one end of Charles Bridge, and heralding entrance to Prague's Old Town. Work on the tower's construction began shortly after the foundation stone for Charles Bridge was laid in 1357, on the orders of Emperor Charles IV. It was completed in 1380. The Old Town Bridge Tower was conceived as a triumphal arch through which the Kings of Bohemia would march on their coronation procession from the Old Town up to Prague Castle. It also served a military purpose, forming part of the fortification system of Prague, built to protect the Old Town against northern invaders. Although partially damaged by the failed attempt of marauding Swedes to occupy the Old Town in 1648, sculptures by Peter Parler (whose genius can also be seen in St. Vitus Cathedral) survive. Climb the 138 steps inside the tower to reach the gallery, for a bird's-eye view over Charles Bridge, the Vltava River, the Old Town, the Lesser Town and Prague Castle. 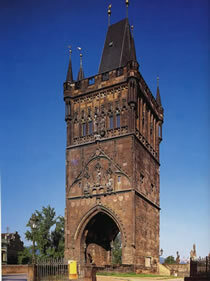 On the opposite side of Charles Bridge, guarding entrance to the Lesser Town, is the similar looking Lesser Town Bridge Tower.